The limited edition Mac TV had a bit of an identity crisis. It came in a black LC 520-style case. 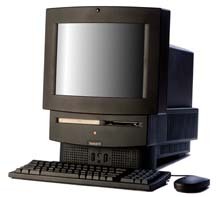 (It is one of only a few Macs to have ever been black.) It came with a cable-ready TV tuner card, and included a CD-ROM drive. Only 10,000 Mac TVs were made before it was discontinued. However, Its TV-tuner card has become a popular option on many LCs and Performas.